Since the last column, "Panic Antidote", the markets have rallied strongly. Our portfolios are already back in new record territory thanks mostly to the under-weighting of small-cap stocks, and picking up some Asian value during the August correction. The marketocracy model portfolio, SZDM, has also hit a new all time high and is now up 12.3% since its inception, 8 months ago, despite hiting two sharp corrections (February-March, and July-August). The verdict, at least for now is clear: those who stayed the course, are now roughly back where they were. Those who threw in the towels and sold in August, are now roughly 10% in the hole. The real winners are the few who had both free cash (planning and foresight), and guts (a difficult mental process) to buy in August. They are now way ahead. As often is the case, the best guide is the data itself. The broad US index as represented by the S&P500 closed the week just 1.9% below its all-time high and the DJI has been showing even greater strength closing the week just 1.6% below its all-time high. In contrast, the past 6 years leader, small-cap value, as represented by the ETF IWN, is showing great weakness and is still a whopping 10.3% below its high. As long as credit remains tight, and the sub-prime fears and write-offs keep coming, and the dollar keeps falling, I expect the large caps multi-nationals all over the world to keep hitting new highs, and domestic small caps to keep on lagging. Until this trend changes, I'll continue to avoid small-caps. Large-cap ETFs have been dominating my ETF rankings for several months now (see the May 19th, article). One more important data point is earnings. Going into the last earning announcements season, expectations were sharply reduced across the board. Like a perfect repeat of the prior quarter, the fears proved overblown. The companies in the S&P 500 ended the Q2 earnings season with an increase of 9.9% over the same quarter in the past year according to this IndexUniverse.com article. A recession is defined as two quarters of decrease in GDP. The catch in this definition is that often, recessions are declared in hindsight. i.e. after they have already occurred. Moreover: since the markets are forward looking, they usually start moving up in anticipation of renewed growth. This tells me that even if the Cassandras are correct (the always are, eventually), and we are now in the midst of a yet to be announced recession, the markets which were hit so hard in the past month, may already be looking past the crisis. 2007-10-01 update: "when there's an elephant in the room, address it." Stop the presses, Citicorp, the biggest (market cap) American bank is finally out of the closet. Every one was waiting for their terrible news. They just warned (quote): "Citicorp said on Monday its quarterly earnings will drop 60 percent on $5.9 billion in losses and write-downs from subprime and leveraged loan woes, fixed income trading, as well as weakness in its consumer business." What did the 'C' stock do? It went up 2.4% on the warning and closed the day up 2.25%. The fears were already priced in (look at the 'C' chart: shares are already down about 15% since January). The write-off is huge, and looks like it is meant to put an end to the speculations and move forward. Old news do not move markets. Only new information does. 2007-11 update: more shoes are dropping. Losses and write offs from the sub-prime debacle are seen larger than before. Citigroup's CEO is out. So is Merril Lynch's. This time this is news so financials and especially US financials, are tanking hard again. The question is how many shoes will have dropped when this string of bad news finally ends. I don't have the answer. Shades of a U.S recession are looming large. In classical Modern Portfolio Theory (MPT) the most common way of measuring risk adjusted returns is to take a series of past returns (R1, R2, ..., Rn), calculate their mean (gain: so the higher the better), and standard deviation (risk: so the lower the better), and divide the 1st by the 2nd. is the famous Sharpe ratio, named after William Sharpe who won the Nobel Memorial prize in Economic Sciences, in 1990, together with Markowitz and Miller. To account for compounded returns, one should multiply rather than add the returns. So the MeanReturn number above should be the Geometric mean rather than the simpler arithmetic mean. Another way to say the same thing is: the distribution of the returns should be assumed to be 'log-normal' rather than 'normal'. Moreover, returns of financial assets are, in fact, not normally distributed to begin with. The distributions tend to have 'fat tails' (greater kurtosis) rather than have the classical bell-shaped Gaussian (normal) distribution. In other words, extreme gains and losses in returns series are more common than expected. In addition, the distributions almost always have a skewness. They are not symmetric around their mean. In fact, one shouldn't stop after accounting for kurtosis (fat tails) and skewness (tail asymmetry), there's a potentially large number of 'higher moments': all kinds and shapes of irregular bumps in the distribution. Only by accounting for all these irregularities, the full distribution of returns can be represented accurately. Since the introduction of the Sharpe ratio, there have been many attempts to come up with more representative risk-adjusted measures. The interested reader may look up terms like Sortino Ratio, Jensen's Alpha, Treynor Ratio. Many financial modelers "gave-up" on finding a parametric closed formula representing reality. Instead, they use "Monte Carlo" simulation: given a series of past returns, they simulate future returns by drawing a random sample of returns from the past distribution of returns. In other words, they simply simulate the future by sampling from a full and exact representation of the past. Finally, they repeat the simulation multiple times to come up with a series of possible scenarios and a range within which future returns are likely to fall. You may read more on post-modern portfolio theory and about Monte Carlo simulation in Wikipedia. Recently (2002), two financial researchers (Keating & Shadwick) came up with a new risk-adjusted measure: Omega. With a tongue in cheek, they described Omega as a "sharper ratio". Omega looks at the cumulative returns (the integral of the returns-series) relative to some threshold, and by that manages to capture all the higher moments of a distribution (mean, deviation, kurtosis, skew, and more...) in one simple number. 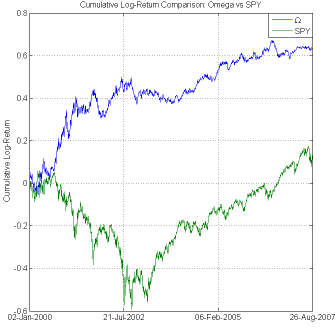 Omega can be computed either against a constant benchmark such as the current risk-free return, or against another series of returns, like the S&P500. Those who want to read more about Omega and how it is calculated, can read the classical paper an introduction to Omega [195k, PDF] by its inventors, Keating & Shadwick. Reading this paper is highly recommended. 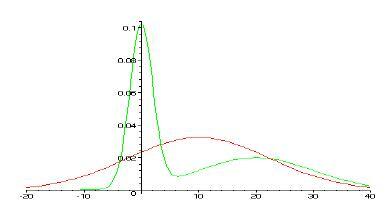 The chart on the right, taken from the paper, shows two distributions one in green and one in red. Even though both distributions have exactly the same mean (10) and variance, the green distribution has much better risk-adjusted characteristics than the red one. You can see this intuitively: the red distribution is more uniform, so if often 'loses' a lot, the green one loses frequently but its losses are very close to zero, it also has a big bump on the right, so once in a while it 'hits the jackpot' which more than compensates for the excess of small losses over small gains. One caveat must be mentioned. All these methods have the same fundamental flaw which is relying on the past to predict the future. As you know: "past returns are not a guarantee for future results". The reason I like Omega is that it is a closed formula, not requiring simulations, it is intuitive (values > 1.0 mean excess returns over the chosen benchmark, and values < 1.0 mean under-performance of the chosen benchmark) and given that past data is often the best we have, it accurately represents the distribution of past-returns, with all its higher moments and quirks. Based on some early experiments I ran, Omega seems to be a better way to estimate risk adjusted returns than anything I've used so far. To appreciate the potential of Omega, you may read this short article. In this article, Michael Bommarito demonstrates a 4x out-performance over the S&P500 during a full market cycle (bear+bull markets). The simulated period is January 2000 to August 2007 (7.5 years) as seen in the chart on the right. The way this 4x out-performance is achieved is based on Omega. First, the S&P500 index is broken into its 9 constituent market sectors (using the 9 SPDR ETFs: Financials, Energy, Technology, etc.). These 9 sectors are ranked and weighted by their Omega metric. Lastly, a portfolio (called Omega) is constructed where the top half (highest Omega score ETFs) are bought using their omega weightings while at the same time, the bottom half (lowest Omega scores) are shorted. Overall, this portfolio is "market neutral," so it under-performs the S&P500 during bull markets. But this is more than compensated for during the bear market period, when instead of going down with the market, the Omega weighted portfolio goes up sharply. When applied like this, with proper weightings, Omega seems to be another useful tool in assigning weights to investment and portfolio construction. Update: Alchemy alert! In retrospect, the above results looks too good to be true to me. The author didn't mention it in the article, but I suspect he was calculated Omega on the same periods on which he ran the performance simulation. In other words: this looks like sharing the same data for both the model train-set and test-set. Equating hindsight with the future is a no-no in any real-life model building. If true, this example should be mostly discounted. Stay tuned for a better ranking metric for ETFs using Omega. In this Friday's ETF rankings, the dominant themes are: large-cap European stocks, Energy, Defense and Aerospace, Telecoms, Industrials and Materials. The extreme rise in the top ranking Asian countries (Korea, Taiwan) in the past 3 weeks has pushed them a bit down the ranks due to too much momentum, yet they are still holding their own among the top stars. In Europe, Germany has the top spot, but the multi-country mega-caps ADRU and ADRD are now #1 and #2. In the WisdomTree fundamentally weighted family, the large caps (DOO, DOL) are now the stars, while old small-cap leaders (like DLS, and DFE) have dropped out of the top 40. At the end of the Aug 3 article on portfolio optimization, I experimented with a new method trying to construct an optimal portfolio. The simulated annealing algorithm came up with the following (equal-weighted) mix of 7 ETFs. It is interesting to revisit this portfolio and see how well it did over the past correction and its aftermath. The overall verdict is net-positive: on one hand, the recent correction made this portfolio lose more than its SPY benchmark. This is due to 20% more beta (1.2) and 34% more 30-day annualized volatility (Volatility = 24.86% below). Yet, overall, on a risk adjusted basis, the portfolio did very well. It trounced SPY on total return by 49%, and had a 46% better Omega ratio over the 39 trading days that followed its construction. The recurring theme to take home from this is, as we see over and over: out-performance comes with increased volatility. It is extremely hard to get one without the other. If you want to beat the index in the long term, be prepared to go down more during sharp corrections. Of course, returning 9.12% in less than 2 months is not sustainable, so the annualized return number below is overly optimistic. It simply based on the extreme movements down and then up we saw in the past month. Such extreme gyrations are not likely to repeat soon. Omicron is my own 'little omega' invention: it is similar to Omega, in that it tries to represent the weighted whole series of past returns, but leaves out the integration step which captures all higher moments of the distribution. Omicron is weaker than Omega, so why bother? Because it has added value when compared to Omega. This is somewhat akin to taking the derivative of a function, or taking a longer-term moving average. When compared to the function itself, even though it has less information content than the original, it tells you something crucial about the higher order function (direction, extremity, etc). All these indicators: Omega, omicron, and the ratio between the two, are oscillators. Oscillators are financial indicators which tend to stretch and then revert back to their mean in a somewhat periodic way. Omega captures higher moments. But, like many other indicators, higher moments don't persist forever. Instead they tend to average out: they stretch to some extreme, then spring back to their long-term average. Omicron ignores the higher moments and by that can serve as a 'low pass filter' of Omega. Also, all these oscillators, when calculated over shorter terms, tend to reach more extreme values (both small and large). All these oscillators may serve as proxies for market intermediate extremes. When the values are high, they seem to indicate low volatility, predictability, and overconfidence (i.e. the portfolio/asset may be "overbought") and when they're low, they mark periods of higher volatility, anxiety and a potential signal "hey, perhaps it is time to get fully invested!" These observations require much more back-testing across different prtfolios and markets, but if true, it looks like we may still have a way up to go from here. I'll keep watching these ratios in the coming months and report here. That's about it for this September. I hope to write again around the end of October.